Sober Look: Japan's growing fiscal burden is in an "unstable equilibrium"
Japan's growing fiscal burden is in an "unstable equilibrium"
Japan's public sector has been the beneficiary of extremely low rates for quite some time. With the central bank financing new debt issuance by "printing" more yen, rates are expected to stay low in the near term.The public sector however has become complacent about its ability to borrow at these low rates (with the 10-year JGB now yielding less than 0.9%) going forward. This situation is what physicists call an "unstable equilibrium" (when a slight perturbation sends the system in search of a new equilibrium). It means that given such a tremendous public debt burden, a slight increase in rates will cause a material rise in the cost of servicing debt. That in turn would require new debt issuance, increasing the supply and raising rates further. The debt burden then quickly spirals out of control. Many "developed" economies are facing this problem, but Japan's situation is particularly acute. The chart below shows the impact of a 2% interest rate increase in 2015 on the public sector leverage - and particularly the leverage trajectory (moving toward 325%). Other than the BOJ's QE holding down interest rates, the public sector has also benefited from high household and corporate savings rate (the so-called "non-Keynesian effect"). Savings are consistently moving into cash, ultimately ending up in JGBs and keeping rates low. But as BNP Paribas points out in their recent report, this trend is not sustainable. BNP Paribas: - ... no matter how strong the non- Keynesian effects might become this mechanism cannot go on forever. For if net capital stock continues to decline because corporate capital formation has stopped, trend growth will at some juncture fall below zero. That means the trend for tax revenue will also clearly drop off. It will then become clear that future tax receipts won’t ever be able to repay public debt, with the result that interest rates will start climbing. 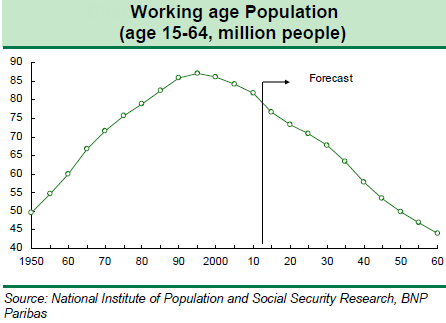 The simple fact is that the number of working age people in Japan is on a steep decline. That means that even with the savings rate unchanged, the total amount going into savings as well as the tax revenues will decline. Some argue that in order to get its budget deficit under control (and therefore keep rates stable), Japan can simply raise its consumption tax (which is low relative to other developed nations). But within 10 years the budget deficit is expected to exceed 17% per annum. The consumption tax would need to be raised to around 40% (from 5% now) just to plug that deficit hole - a highly unlikely (politicians have been fighting over just a 5% tax hike) and a fairly disastrous scenario. But even that won't be enough. BNP Paribas: - Tax hikes alone cannot solve Japan’s problems. Unless the increase in social welfare costs is held to within the range of nominal GDP growth, tax hikes will have to continue almost indefinitely, and social welfare and state finances will ultimately collapse, when tax hikes reach their limit. It is therefore only a matter of time before Japan's unstable equilibrium is perturbed by rising rates. And even if by some miracle rates do not rise, the escalation of debt interest payments from increasing leverage is not sustainable in the long term. 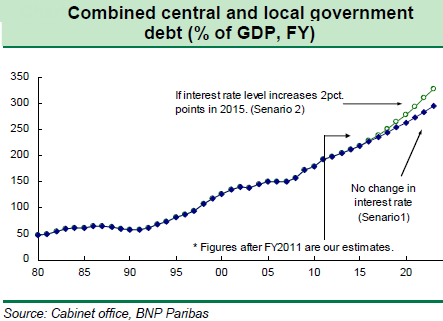 BNP Paribas: - Even if there is no change in the cost of capital to the government, debt interest payments will escalate alongside the swelling public debt. In other words, the “interest rate bonus” that has curbed the government’s interest burden has ended.